At the annual conference of the ‘Ilankai Tamil Arasu Kadchchi (ITAK)’, which he heads as the elected president, the nominated chief of the larger Tamil National Alliance (TNA), R. Sampanthan, made a few points. One, the ITAK was the leader/ guiding spirit of the TNA and that the Sri Lankan Tamils (SLT) have for long accepted the ITAK as reflecting their aspirations. Two, the contributions of the Diaspora SLT should be acknowledged but they should allow the leadership on the ground to negotiate the best deal possible for the Tamil civilians living in Sri Lanka in the post-war circumstances. Three, the failure of the LTTE meant that violence did not pay and that the Tamil community should adopt political methods to achieve their goal ? particularly since India, the US and the rest of the international community were with them. Four, all Tamil-speaking people should unite for the common cause, and that the Tamils should be talking to the Muslim community, to this end. Broken into components, there could be further points and pointers to Sampanthan’s thinking in his Batticaloa. It was one more ‘balancing act’ on Sampanthan’s part, an eternal attempt at keeping the flock together. His reference to ITAK as the leader of the TNA pack, and kind of a conscience-keeper of the Tamil community seemed to have flown from the need for continuing with the post-war moderate approach of the TNA in the dealings with the Sri Lankan State and the Government of the day. As reports indicate, an effort is on in recent times in the Tamil polity to drive a wedge between traditional moderates, as in the ITAK, and one-time militants (not all of them from the LTTE stables) who gave up arms long ago and many of whom are partners in the TNA since. Whether true or not, the reports claim that the moderates are trying to side-line Tamil politicos with a militant past. This, the sub-text has it, is being done not with any altruist motives in the interest of the larger Tamil cause but only to sub-serve collective self-interests of a few, new and old. EPRLF leader Suresh Premachandran did not lose much time to contest Sampanthan’s claims that the ITAK played a leadership role within the TNA. He said that the TNA accepted Sampanthan as their leader but not the ITAK as their guiding force. He may have a point as militant groups like the EPRLF and TELO, both original members of the TNA and PLOTE a post-war entrant with a limited role, had been founded alongside the LTTE, even when the ITAK was more active in the Tamil politics of the pre-war era. They had differed with the ITAK and such other moderate groups on methods, not motives. Premachandran claimed that the ITAK had only three members of Parliament among the total 14 after the 2010 parliamentary polls. The TNA still remains a parliamentary grouping with the ITAK’s ‘House’ remaining as its common electoral symbol. The parliamentary strength of the Alliance came down to 13 after the lone Sinhala member from the East crossed over to the Government side. Premachandran’s argument is that post-poll, the ITAK could not claim to be numerically stronger than other individual grouping by adding on new members at the top. Truth be told, the reverse may still be the ground reality, which the likes of Premachandran want to wish away. Sampanthan’s response to Premachandran’s arguments has been muted, as was only to be expected. Yet, over the past months, the octogenarian leader is seen as being more assertive in intra-TNA affairs. During the run-up to the UNHRC vote on Sri Lanka earlier this year, Premachandran claimed that Sampanthan’s decision not to send a TNA team to Geneva to campaign their cause was unilateral and taken without consultations. Sampanthan contested the claims and clarified that prior consultations were held, if only on phone. He also gave out the reasons for his preferring not to send a TNA team to Geneva, which he said could have proved counter-productive, now and later. The TNA, as he indicated at the time, would have to negotiate with the Government in Colombo, after all, and no useful purpose would be served on this front, if the TNA were to campaign against it in Geneva, now (and possibly got identified with Diaspora groups, most of whom still favoured a separate State). In context, Sampanthan claimed that the international community was already seized of the matter, and no additional purpose would be served by the TNA campaigning for the cause beyond a point and in Geneva. 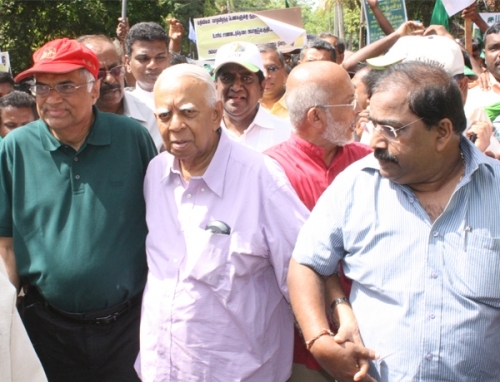 More recently, Sampanthan publicly defended his act of holding a Sri Lanka national flag in the company of UNP Opposition Leader, Ranil Wickremesignhe, at their combined ‘May Day’ rally in Jaffna, on May 1. This time, the criticism came from MaavaiSenathiraja, a trusted aide of Sampanthan, who was later re-elected General Secretary of the ITAK at Batticaloa in May. Maavai, attributing his position to agitated queries from near and far in the Tamil community, said that Sampanthan’s act was unacceptable, as the Tamils had not accepted the Sri Lankan national flag, almost since inception. Sampanthan hit back this time, too, pointing out how the national flag formed a part of the Sri Lankan Constitution. He submitted that as members of Parliament, they all had taken oath under the Constitution, and could not thus diversify the flag from the Constitution. He also recalled how in the past he had hoisted the Sri Lankan national flag, and how he would do so in future, too, if called upon. The message was clear. Despite the triggers and temptations provided by the vote against Sri Lanka at Geneva, Sampanthan continued to hold the post-war position of negotiating with the Government, for finding a political solution to the ethnic issue within the four walls of the Constitution, as it existed today. Translated, it meant that the Tamils, as represented by Sampanthan’s leadership, would be looking for meaningful, devolved powers under a united Sri Lanka. At Batti, however, Sampanthan also referred to the re-unification of the North and the East, ordered separated by the Supreme Court in 2006, three years before the conclusion of ‘Eelam War IV’. For this to happen, he indicated that the Tamils would have to bring the Tamil-speaking Muslims on board. His preference and that of the TNA for the Sri Lanka Muslim Congress (SLMC) in this regard is not unknown. Yet, lasting Tamil-Muslim political unity going beyond electoral adjustments between the TNA and the SLMC, if at all, is easier said than done, if one looked at the internal divisions within the Muslim polity and community, as well. Sampanthan is not unaware of them. Critics say that Sampanthan at best has sent out confusing and contradictory signals from Batti. According to the critics, while indicating peaceful methods as their modus, Sampanthan has not indicated negotiated settlement as a way out. Instead, he had referred repeatedly to the Tamil goal, indicating that a ‘separate State’ might after all be in his thought process. This has made friends of Sampanthan and the TNA, both in Government and elsewhere, uncomfortable. They had expected Sampanthan to outline their new approach, if any, to the TNA joining the Parliamentary Select Committee (PSC), as mooted by the Government. There was no reference of the kind however, in his speech. Some critics would even want to refer to Sampanthan’s speech at Batticaloa as a ‘second Vaddukottai resolution’, on the footsteps on the original one, given to the Tamil community in 1976, by the late S J V Chelvanayagam. Sampanthan’s reference at Batti, to Gandhian methods to achieve the goal has a ring of SJV to it. It is in this context, Sampanthan’s constant reference to India, the US and the rest of the international community being on the side of the Tamils of Sri Lanka assumes significance. For long, the Sri Lankan Government, particularly under President MahindaRajapaksa, the incumbent, has insisted that there could be no external influence but only a ‘home-grown solution’ to the ethnic issue. As if to attest to the same, the TNA also entered into halting talks with the Government. The talks have once again been halted, with each side blaming the other, and the Government proposing the PSC in between, as the only sure way to ensure an ever-enforceable political solution, based on national consensus ? or, one with a substantial support. It is in this background, India, the US and a substantial section of the international community joined hands in voting on a Sri Lanka resolution in Geneva. Though the resolution covered only human rights issues, the expectation, particularly in Tamil/TNA circles was that it could well be a tool for the international community to make the Sri Lankan Government to find a lasting political solution to the ethnic issue. Doubts persist. The TNA itself is an amalgam of a few Tamil political groups and individuals elected MPs under the Alliance banner under the common ‘House’ symbol of the ITAK. They do not ordinarily represent the will of every Tamil in the country and overseas. There is no explanation how the common Opposition candidate Sarath Fonseka polled more votes in the Tamil North than all the TNA nominees for the parliamentary polls less than three months later, in April 2010. The votes polled separately by the UNP and SLMC candidates in the parliamentary polls do not account for the huge gap. There is nothing to suggest that the TNA and vociferous Diaspora groups like the Global Tamil Forum (GTF), British Tamil Forum (BTF) and the ‘trans-national government of Tamil Eelam’ (TNGTE) are on the same page on issues and methods. It is unlikely that the international community has understood these implications for the Tamil polity and society in Sri Lanka. In the past, the LTTE had time and again exposed the naivette of the international community, by leading them up to a point, and going back on commitments without a trace. If the Colombo Government too had excelled in the practice as much, that would still not resolve the problem for Sri Lanka ? or, for the international community, which is otherwise serious about an early negotiated settlement. If the past is anything to go by, the international community would soon find itself caught in the cross-fire of a blame-game between various stake-holders in Sri Lanka. In this, the Sri Lankan players have displayed a greater determination at obfuscation and have displayed proven tactics for that part of the world than the international community is ready to acknowledge (as failure of their own strategy in and for the island-nation). In the present case, the Diaspora groups not inclined to a negotiated settlement could be expected to derive strength from the ‘Geneva vote’, and expect to arm-twist the international community in ways that the latter had not thought possible to try and have its way. The revival of the demand for a referendum on a ‘separate Tamil State’ in the weeks after the Geneva vote should be a pointer. It is also a leaf out of the LTTE book. The game would not be unilateral however, whatever the prescription of the international community is in contemporary the Sri Lankan context, and the methods it hopes to adopt in achieving that limited goal, if at all, for the ‘suffering Tamils’ of Sri Lanka. Any revival of apprehensions/suspicions about a change in the mood of the post-war Tamil polity in the country (read: TNA) and possible revival of hard-line approach would have a cause-and-effect result in the Sinhala community and polity, too. Much as they may blame the incumbent Government as the cause, the consequences would remain as much the same as if Colombo had yielded early on in the post-war years on power-devolution and political solution. If the international community were to think that Geneva was mainly a way to force the Colombo dispensation to come around to yielding greater political space for the Tamil community, and the Tamil-speaking people in the island-nation, it would not stop there. Instead, preconceived notions of an imminent revival of Tamil militancy, now or later, could force all sections of the Sinhala polity to rally round the Government ? and more so, the security forces, and the consequent hard-line political stand that could emanate in their midst. Lately, media discourses in Sri Lanka have often referred to the West anticipating/wanting an ‘Arab Spring’ kind of situation evolving in the country. Open identification of some western countries, particularly by their diplomats in Colombo at the time, to the candidature of Sarath Fonseka in the 2010 presidential polls, have revived ‘hopes’ of such expectations in some. Or, so it seems. If that were to flag pan-Sinhala, pan-Sri Lanka nationalism, instead, the chances are that hard-liners, across the board in the Sinhala polity and community, despite their relatively smaller numbers, would have won. Their victory would be across the board in all Sinhala political parties. Their respective leaderships, working assiduously for a democratic change-over in the traditional way that Sri Lanka has known since becoming the first Asian nation to usher in universal adult suffrage in 1931, would not be able to resist the hard-line stance that only a few members in their respective parties may actually project and propagate, otherwise. In the pre-war past, mutual provocation, coupled with imaginative preparation by the LTTE, had pushed the two sides into a military confrontation. It went beyond traditional forms of terrorism, and may have been among the nemeses of the LTTE. A bloated military establishment, always in need of men and material to fight a conventional war, and an attendant civilian administration that the LTTE could not maintain in the absence of a State structure and recognition, added to its woes. The latter were otherwise steeped in the tactical imagination of a single man called Prabhakaran ? who, to himself and his following across the world, could do no wrong, and had isolated himself from the outside world owing to the high-price that Governments had placed on his head. Since the early months of the conclusive ‘Eelam War IV’, Diaspora groups had been known to have discussed a tactical change in their overall approach, yet to obtain the same goal ? from militancy to moderate politics with international blessing, and/or from catastrophic terrorism targeting common civilians of whatever kind unacceptable to post-9/11 world, to State-specific insurgency after a time, and using the interregnum to push Sri Lanka into that remiss, through tactical, political moves, one at a time, unnoticed by the international community and in ways the Sri Lankan Government takes the blame in the end. Human memory being short, and short in particular for more recent developments, if it came to as much, it would only be a repeat of what Sri Lanka went through the pre-Eighties, when alone political moderation among the Tamils had to vacate all the space in favour of youthful militancy, which went beyond the tactical way to force the Government to negotiate with the Tamil polity, as may have been originally envisaged. If the security forces of the time was as much unprofessional as they were ceremonial otherwise, their conduct in the Tamil areas, and their handling/manhandling of Tamil youth arrested on suspicion provided enough grit for the rumour mill, but more so, justification for the furtherance of militancy/terror tactics. The predominant American presence in Sri Lanka may have provided the justification for the early batches of Tamil militants to train and arm in Palestine. The rest, as they say, is history, yet the provocation provided by the bank robberies and skirmishes in interior villages, meant that the cycle of violence culminated in the anti-Tamil, Pogrom-83, leading to further war and violence over the next three long decades. The lessons are not far to seek ? or, see, either. Under the circumstances, the Sri Lanka situation would be much different from that in ‘Arab Spring’ nations. There, the transformation was from constitutionally acknowledged dictatorship/ authoritarian approach to grassroots-level democracy of some form. Sri Lanka is well past that stage. It has a vibrant democracy movement. Strategies and tactics that worked elsewhere need not produce near-similar results. If anything, democracy would become the voice of the nation. Political parties otherwise opposed to the Government in Colombo could find the limited soil under their feet slipping by, too. The Opposition leaders would be scrambling for cover when targeted as ‘anti-nationals’ or ‘stooges of the West’, an opprobrium that they have always found difficult to live with. Should Tamil militancy be allowed to revive, the consolidation of the rest of Sri Lanka under the banner of a ‘Sinhala nationalist identity’ could not be stopped either. There is also the question of the Muslim identity and their political aspirations that needs to be addressed, particularly since the upcoming Census figures could throw up as many opportunities as there could be accusations. That is another area where the Sri Lankan Government would have to take sanguine decisions early on, without letting Sinhala-Buddhist nationalists to take a lead in the matter, as was the case on the Tamil front in the past. It is not just about the Sri Lankan Government, but also of the otherwise divided Sinhala polity as a whole, which the Tamils for long have been charging ? and at times rightly so ? of allowing themselves to be led by the hard-liners, whose cause also sub-serves their political agenda, at the cost of those original agendas of other, major sections of the polity. This all has been a part of the vicious circle in which Sri Lanka has been caught through the decades after Independence, and there is such a threat all over again ? or, is there one? This was the past and so has been the present. This could also be the future.